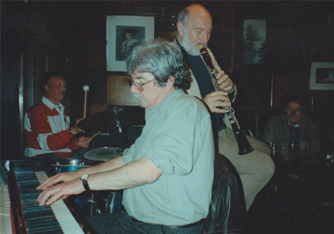 Picture: The trio in action at the Plough. Jamie, Coops and Ian Howarth on drums. If I knew he was playing at a particular venue, I would sometimes turn up just for a chat during the interval although he was doing quite a lot with a really horrible trad outfit which I found rather offensive. I thought it was a waste of his talent appearing in that type of band but Coops always remained sympathetic to his musical roots. It was in the spring of 1990 that Jazz at the Junction sprang shakily into life. Coops had been playing in an East End pub near the art institute where he sometimes taught. It was a very successful scene and the locals all flocked into the pub making the guvnor very happy. In a fortunate co-incidence the landlord had decided to take over a pub called the Plough near Clapham Junction and wanted Coops to fix up some jazz sessions for him. The pub was only a couple of hundred yards from my front door in Plough Road and not a lot further from Coop’s Bolly residence in the other direction. Thus we achieved most musicians’ dream, a residency which was literally a walk from home and no worries about drinking and driving, transport there and back, and the rest of it. One of Coops’ old cronies, Stan Greig, sold the guvnor, Denis, a piano (although that was to cause grief later) and we were all set to go. Picture: Coops served in the RAF for his national service. It is unclear for which campaign this medal was awarded although it could have been the Campaign for Real Ale. In the 70s the pub had been quite a jolly working-class boozer selling good Youngs ales although anyone who wasn’t a Battersea gor-blimey was regarded with suspicion to start with. Unfortunately, Fred, the guvnor died suddenly and in his wake came a series of disinterested and incompetent managements and the place was gradually avoided by anyone who wanted a civilised pub with a welcoming ambience. Picture: The trio at the Plough but with Blind Douggie sitting in on drums. Bicycle Jim lurks in the background. Denis imagined that if he put on jazz a couple of nights a week the “nice people”, as he referred to his desired clientele, would come flocking in. It wasn’t a bad theory because the demographic of the Clapham Junction/Battersea area was changing quite dramatically as younger middle-class couples bought up property and many of the old three-storey Victorian terraces were being converted into flats for the trendy influx. To a degree that is what happened because, in my experience, if there is one thing that most yobs and neanderthals hate it is jazz. But there were quite a few things going against making the Plough a really successful jazz pub. First there was the layout which made it difficult for more than a few punters to get near the band and there was no amplification system either. Then there was the totally depressing cloud which seemed to hang over the place, with its brown walls and carpets. The stench of postwar austerity seemed to linger on into the 90s in the Plough although Denis did his best to cheer the place up with new flooring and furniture. The piano which Stan Greig had provided was sinking by a semitone every week or so and Denis, naturally enough, thought that buying the instrument was the end of his outlay and objected to forking out money for a tuner continually. This sometimes meant my trying to play a hopelessly out-of-tune piano, horrible for me and just as bad for anyone listening too. Another minus point was Denis’s wife Eileen who profoundly loathed all forms of jazz music. It was her habit to play Elvis Presley and suchlike on the pub’s tinny sound system immediately before we started the session which went down like a pork chop in a synagogue with the jazz-seeking audience who turned up a little early. Anyhow, above gripes apart, once Coops, Ian Howarth and myself settled down into regular trio sessions one, and sometimes two, nights a week We hit a groove which I think surpassed anything we had done at the Old Bailey boozer (The Rumboe Years). We broadened the repertoire even more and added lots of more interesting tunes to the traddy standards. “Night and Day”, “Blue Monk”, “Cheek to Cheek” , “You’ve Changed” and “Nice Work if You Can get it” were likely to be mixed in with the “Shines” and “Indianas”. And, of course, just like the Rumboe, the respect and appreciation which Coops attracted on the scene guaranteed lots of musician visitors every week, some to sit in, some just to listen. Regular visitors were avant-garde sax player, Lol Coxill; ex-Bonzo Dog percussionist Sam Spoons; Coops’ old Leeds crony, guitarist Diz Disley; pop star Thunderclap Newman: author and trumpeter Jeff Nuttall: cellist Stanley Adler; Humphrey Lyttelton bassist Brian Brocklehurst; Alastair Robertson of Hep Records; pianist Martin Litton; and many more. 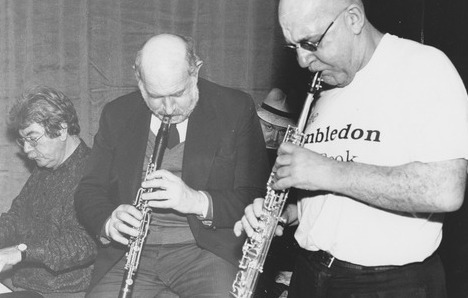 Coops and Lol Coxhill made a great pairing. You couldn’t imagine two more different musicians but they both had an unblinkered attitude to music and played some of the best and most creative stuff I have ever heard. 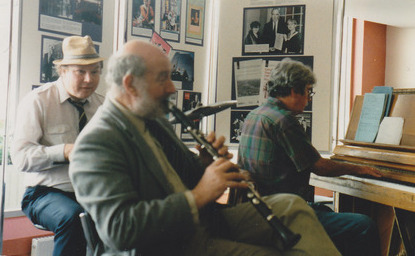 Then there were many London-based musicians who called in to pay their respects and play with us, including Keith Nicholls, Bill Greenow, Mel Henry, Geoff Simkins…the list could go on and on. As the venue became better known and patronised we began to get other gigs - weddings, birthday parties and sessions at the Lyric Theatre in Hammersmith and bookings at the Soho Jazz Festival. 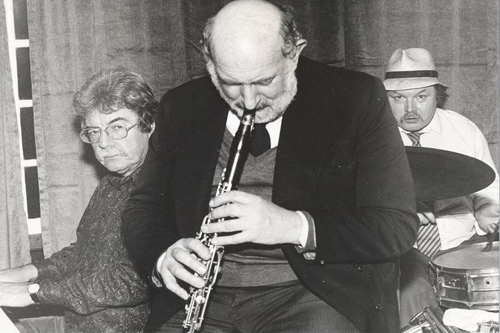 Picture: Lol Coxhill (right), on soprano sax sits in with the trio. Any attempts to record the band seemed jinxed by the giant Indian sign that loomed over the Plough. Roger Limb, who played bass with us for a while before we devolved into a trio, made several recordings in the early days. I still have the cassettes at home and the music shines through quite vibrantly despite the appalling background noises - Bicycle Jim and Dave Smith (over from Eindhoven) shouting at the tops of their voices and the continual echoing crashes of pint glasses against tables. Even my own attempt to record the trio was doomed. Ian and I hired a top-class sound bloke to tape the band and create some sort of record of our existence. Needless to say, Ian and I were still waiting to kick off at 9.15 when Coops rolled in totally legless. The results weren’t too bad as it happens and the sound man managed to cut out much of the background racket. Because the Plough was one of my locals many of my friends and acquaintances made a point of coming to the sessions. The Beehive pub, run by Betty and Joe Trindle in those days, was the hub of the Clapham Junction “village” and Betty was a little miffed to see many of her customers disappearing down the road on Wednesdays and Saturdays. The Plough lasted a surprisingly long time and was the longest residency I have ever had and at my present age it is unlikely I would ever last through another. Some of those nights still remain vividly in my memory and I often think about the Alan Cooper Trio, especially as I am now the only survivor (see Eulogy for Ian below). About a year after we started at the Plough in 1990, Mary and I moved house to Wandsworth. An unmissable business opportunity had arisen to let our old house as a hostel and we decided to buy a smaller and prettier house in a quiet and residential area of Wandsworth. In 1994 our four-year journey ended. Denis was taking over another pub in Cheltenham, Coops had re-married and was planning to retire and move out of London to Hay-on-Wye and, frankly, things had run their course. I played with Coops a few more times after that but when he moved out of London I rarely saw him, apart from that saddest reunion, a funeral. 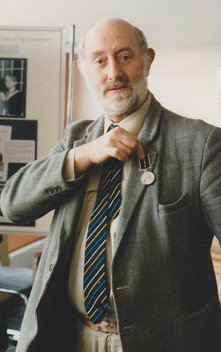 Coops died in August 2007, followed closely by Ian in December 2008. Miss you more than I can say, fellers. Picture: Above, the trio at the Lyric Theatre, Hammersmith, in 1993. 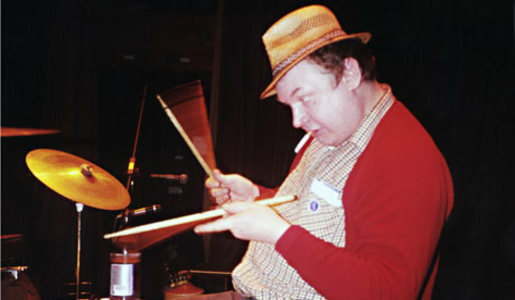 Drummer Ian Howarth was originally from Lancashire where he played washboard in his school skiffle group and trombone in his school orchestra before taking up the drums. He was an original member of the Vintage Syncopators, one of Red Hayes' Jazz Wizards, and played with and led the Temperance Seven. He also played with Alan Cooper's Trio. Ian died of lung cancer in December 2008 aged 60,and his friend, pianist Jamie Evans, gave the following eulogy at Ian's funeral in January 2009 at Putney Vale crematorium. "I played piano with clarinettist Alan Cooper on and off for over 30 years and during the latter part of that time, our drummer was Ian Howarth. I was dubious at first when Cooper suggested we use Ian because, although he was always an engaging and amusing man, I didn’t think a comedy band / traditional drummer would fit in with our broader small group swing style. "I was, of course, totally wrong. Ian turned out to be perfect. He could turn his hand to most styles, from woodblocks to bebop. "Not only that, he was great company and we would often meet for a few pints of real ale even when we had no gigs. “Dr Young’s elixir will soon put you right lad,” (excuse the Wigan accent) he would say toasting me with a glass of Youngs Special Bitter, tweaking his straw hat (summer) or cloth cap (winter). "Well today is a particularly sad occasion personally. Cooper passed away less than 18 months ago and now, with Ian’s departure, I am sole survivor of what Ian always referred to as “Alan Cooper’s famous trio”. I am not too sure about the “famous” but to have lost two dear friends and great musicians within such a short space of time is a double blow. "Ian also counted the late US drummers, Max Roach and Elvin Jones among his friends and he collaborated with a wide range of musicians in the UK, ranging from many New Orleans stalwarts to modernists like Lol Coxhill and Stan Sultzmann.
" I’ll never forget the look of delight on Ian’s face at one of our gigs when Lol Coxhill and Cooper duetted on the most amazing surrealist, free-form version of A Closer Walk With Thee. "One of Ian’s favourites was Thelonious Monk and for many years now I can’t hear two of the great man’s compositions without thinking of him. On one occasion I unwisely attempted a solo version of In Walked Bud but floundered hopelessly on the middle eight. “Not a bad version of Bud Nearly Walked In“, was Ian’s droll judgement.
" And at one of our residencies, in the days when pubs closed at 11 o clock, I used to serenade the departing punters with Round Midnight. Ian soon retitled that one to Round Ten Past Eleven. "It’s a fond farewell to a loyal friend and, on his day, a superb drummer…"